Bayonetta 2 finally has a launch date! Late last night Platinum Games’ Yusuke Hashimoto and Akiko Kuroda announced, via the wonderful medium of the Nintendo Direct broadcast, that the Wii U exclusive will launch on October 24th, and it’ll come in three flavours for those of us in Europe. First up, we’ll be getting the solus version, which contains Bayonetta 2 and… nothing else. 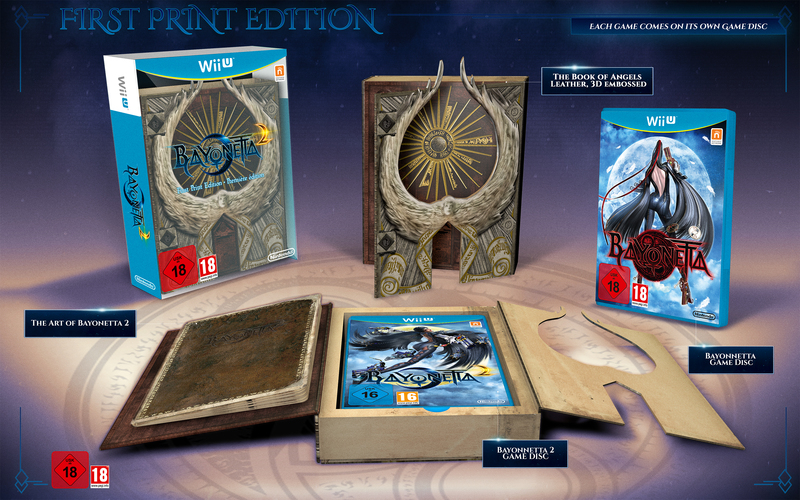 Nope, it doesn’t come with a copy of the Wii U port of the first Bayonetta. If you want that, you’ll have to plump for the Special Edition, which packs both games, each in their own game cases, into a card slipcase. But then there’s the First Print Edition. This is more like the kind of product you’d expect to carry a ‘special edition’ label, packed in an exclusive box (apparently bound in leather) shaped like the Book of Angels, the in-game tome that details the Hierarchy of Laguna. This lovely box contains both games in their own game cases, with a bonus art book contained within the packaging itself. You can see the First Print Edition below, and as an aside, it’s nice to see the cover art for the first game mirroring the original, Kamiya-approved Japanese art from the original release. I’m sure it’s common knowledge by now that I am a sucker for a limited edition, so it should come as no surprise that I wanted this as soon as it was announced. It’s a shame that the art book isn’t a proper book, especially for a game like Bayonetta that has incredible artwork (seriously – hunt down a copy of The Eyes of Bayonetta if you don’t believe me), but I’ll still eagerly pore over those pages. It appears to be exclusive to Game in the UK (at least at the time of writing), costs £59.99 and is limited to 15,300 units, so if you want one you’d better jump in and secure a pre-order now. I’ve already secured mine. 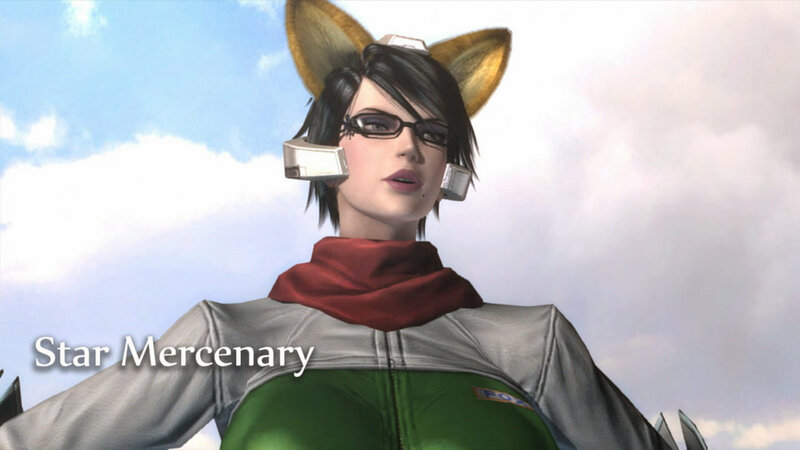 Also announced in last night’s broadcast, which I’ve embedded at the bottom of this piece, was a new Nintendo-themed outfit for Bayonetta to wear. I thought the Peach, Samus and Link costumes were a little bit odd when they were announced back at E3, but this one… this is something else. Why God, why?! What did we do to deserve this!? Truly, I’m sorry you had to see that. But anyway, that can happily be ignored in favour of the stunning action Bayonetta 2 will be bringing us when it launches in seven weeks. The Direct itself is a good watch, and takes time to explain a few things for those new to the series, but keep watching for the epic lengthy trailer at the end – it looks utterly mental, exactly the kind of thing I’d expect from one of my favourite games of the last five years. It looks like Platinum are throwing everything they’ve got into this game, and I can’t wait to get my mitts on it. As a Wii U exclusive! Wait… what!? Well… I was going to buy a Wii U eventually, for HD Metroid goodness… I guess this just accelerates the process. Still, it’s going to be a hard pill to swallow for those that enjoyed Platinum games first Witch-em-up on 360/PS3 that aren’t planning to buy a Wii U. There’s always the possibility it will be a timed exclusive, but Eurogamer notes that Nintendo are publishing the title, so that certainly reduces the chances. I’ll update when I know more.